SC.SD. Oh wow! So you really meant it when you said that you were naughty then?! A visit to stay with her Dad in Riyadh during the school summer holidays gave Alex her first taste of running a business. AH. Dad worked in a big office block and there was nowhere for them to go at lunch… I just thought ‘ok I’ll come up with some sandwiches’ and being a bit pushy I decided that I’d sell them- that’s how it started! It gave me a taste of on entrepreneurship I suppose! It was a challenge and I enjoyed it so then on the side of A-levels and uni, I had this little business which eventually got changed to Social Pantry. Opting to study Hospitality and Business at Oxford Brookes, Alex continued to gain experience during her degree, working alongside her degree, in two of Jeremy Mogford’s boutique restaurants. SC.SD. What kind of restaurants are we talking? Fancy ones? SC.SD. Did they go easy on you, given that you were the only girl? AH. No! I fell out with the grill chef once and the Head Chef was so cross! He was like “right it’s Saturday night service, you’re going to do it with your legs tied together” so we did three legged service… by the end of it we were friends again! SC.SD. Oh my gosh, that’s crazy! AH. Can you imagine that happening nowadays?! The reality is that hospitality is really hard work and the team have to get on. There’s got to be respect within a team, it’s really important that you all work together. I think going into that environment naively, being young and not experiencing a kitchen before, was the best way though- I loved it. It was quite a shock but it’s what gave me a taste for it all! 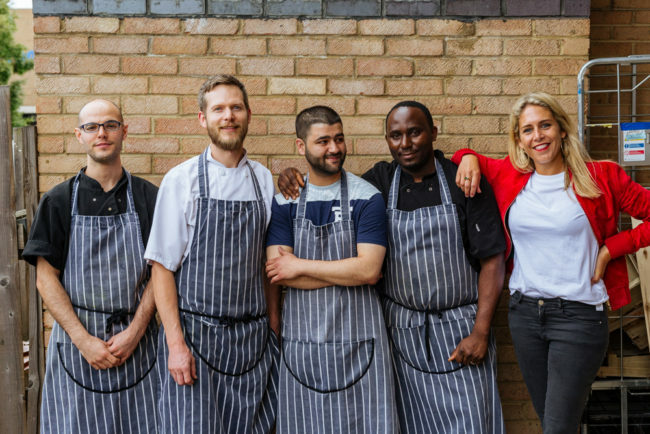 After graduation, Alex moved to London and spent her early twenties opening restaurants for other restaurateurs (all the while taking on board lessons that served to help her later down the line). When the launch of a pizzeria off of Oxford Street failed, she made the decision to jump to catering full time. SC.SD. Why did it fail? AH. It was mainly the location- the council shut the pavement in front of us and people just didn’t walk around the barrier! SC.SD. It’s crazy that something that trivial can affect a business like that! AH. Exactly! You’re vulnerable as a small business and it’s crucial to get people through the door! SC.SD. Ok, so you hop over to catering… what were the initial steps you took to turn the project into a business? AH. So I remember registering a bank account and then I got a website up and running, this is pre- smartphone…To this day though, it’s all about word-of-mouth. By this point, I’d catered for various people, I’d done weddings, I’d made lunches, and so for me the business was there. It’s not like today where you’d do Instagram and make sure all that online stuff is sorted. Back then you just made sure that you had a good product and some people to feed and off you went! Read the full interview with Fiona on She Can She Did here.